The Supertouch Cotton Chrome Gloves- Straight Thumb are simple gloves which offer a practical solution to your general handling needs. 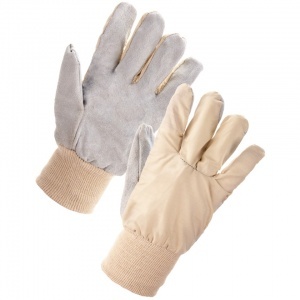 The Supertouch Cotton Chrome Gloves- Wing Thumb offers strength and durability whilst the cotton backing helps to keep your hands cool whilst you work. Through this listing, you can purchase the Supertouch Cotton Chrome Gloves in case quantity, getting 240 pairs of gloves at a discounted price. Ideal for businesses of every size, this Bulk Pack allows you to save money on your essentials. To purchase this product in single pairs, please see the standard listing. The Supertouch Cotton Chrome Gloves- Straight Thumb comes in one size, a large size 9 glove, which should be suitable for use by most people. The Supertouch Cotton Chrome Gloves- Straight Thumb is also available in a Wing Thumb version.